The Auto Ventshade Windflector eliminates wind noise, and drafts and prevents rain from entering the sunroof opening while driving. 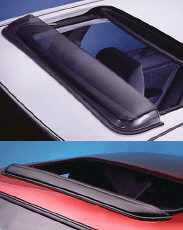 Available in two styles: The Classic for power sunroofs and the Pop-Out version for removable sunroofs that lift upward. Please select the part number that fits your sunroof from the chart below. 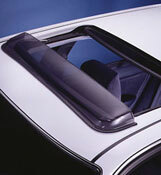 Windflector Classic for power sunroofs, Windflector Pop-Out for pop-out sunroofs. 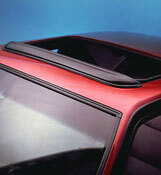 Always measure the sunroof opening from molding to molding before ordering.